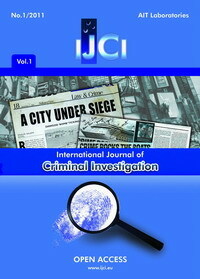 The FORUMUL CRIMINALIŞTILOR - International Journal of Criminal Investigation (IJCI) is a peer-reviewed journal devoted to the publication of original research papers in forensic sciences. IJCI it is an open access journal. ll content is freely available without charge to any user or his/her institution. Users are allowed to read, download, copy, distribute, print, search, or link to the full texts of the articles in this journal without asking prior permission from the publisher or the author. The topics cover all disciplines and branches of modern forensic sciences as: Anthropology, Archaeology, Botany, Chemistry, DNA analysis, Entomology, Engineering, Geology, Informatics, Odontology, Pathology, Psychology Print identification & analysis, Toxicology but also Laws. IJCS publishes original research papers, review articles, survey articles and book and project reviews in all areas dedicated to forensic sciences.